Printable recipe can be found at the bottom of this post. Please help me out by pinning and sharing! Oh my goodness gracious, this sandwich is DELICIOUS, and just the thing after a long day when you want something good to eat but don’t feel like cooking. Is anyone there with me? Seriously. As much as I love to cook, I don’t LIVE to cook, I live to spend time with my family so I love anything that speeds up the process for me. I have a few recipes like this where you stop at the grocery store on your way home, grab a few things, head to ye olde homestead, and have supper ready to pop in the oven five minutes later. These hearty, crusty, flavorful sandwiches are a hit in my family (especially with the menfolk) so I thought I’d offer up the recipe to you, too! If y’all tuned in for my French Onion Soup you are probably starting to see that I love this little packet of Au Jus Gravy mix! It’s quickly becoming one of my favorite shortcuts to add a depth of flavor to any dish. To make these wondrful little sandwiches, you’ll need: Two loaves of Italian bread (you can half this recipe and just have extra Au Jus if you like), Herb and Garlic powder (or a blend of garlic powder and your favorite herbs), onion powder, room temperature butter, Au Jus Mix, Provolone Cheese slices, Worcestershire, and about a pound or so of roast beef from the deli (have them slice it kinda thin). I love deli roast beef. 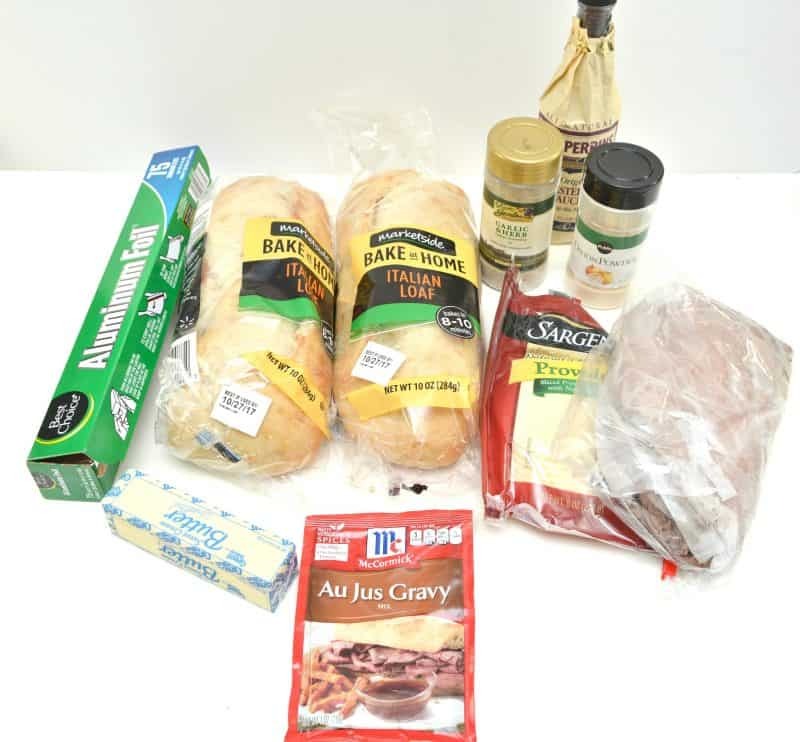 If you want to make your life easier for two suppers this week, make sure you check out my Bama Steak and Cheese Sandwiches. 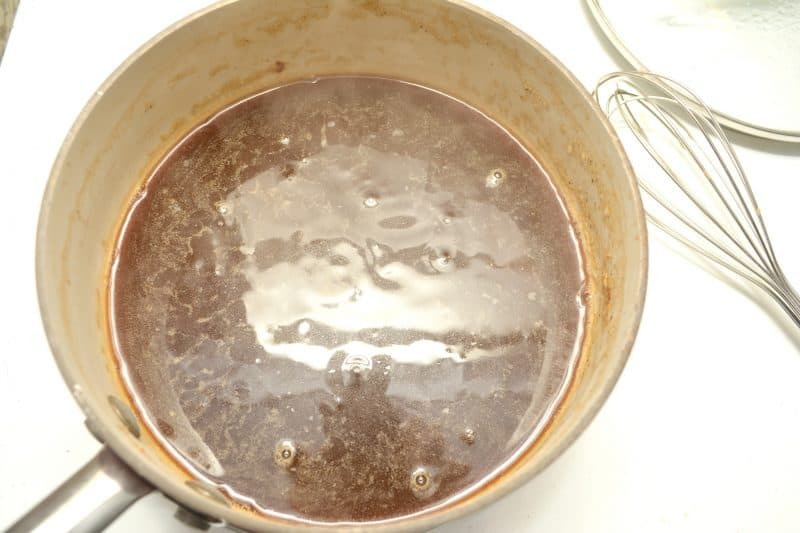 Place butter, 1 tablespoon of Au Jus mix, seasonings, and Worcestershire sauce in a bowl and stir until well blended. If your butter isn’t soft enough you can microwave it a bit but try not to melt it fully. Don’t fret if you do, though, the world will keep on spinning and supper will still be good. It’s sandwiches, not rocket science. Line a baking sheet with aluminum foil. Set a loaf of bread in the center and cut into 3/4 inch slices all the way down, but don’t cut all the way through to the bottom, just close. Using a small spatula or butter knife, divide about 1/4 of your butter mixture evenly between each cut of the bread. Place a folded piece of roast beef and 1/2 piece of provolone between every other cut of the bread. Make sure don’t stuff every other one so that you can have pull apart sandwiches. Spread another ¼ of the butter mixture onto the top of the bread and fold up the aluminum foil to enclose it completely. Repeat with the other loaf of bread. Once both loaves are securely wrapped, place them in the oven at 400 degrees on a baking sheet for about 10-15 minutes or until the cheese to be melted thoroughly and for the crust to get crispy. While the sandwiches are in the oven, combine the rest of the Au Jus mix with 2 cups of water or beef stock in a small saucepan and stir. Bring to a boil, stirring often, and then bring it down to a simmer to thicken a bit until the bread is done. 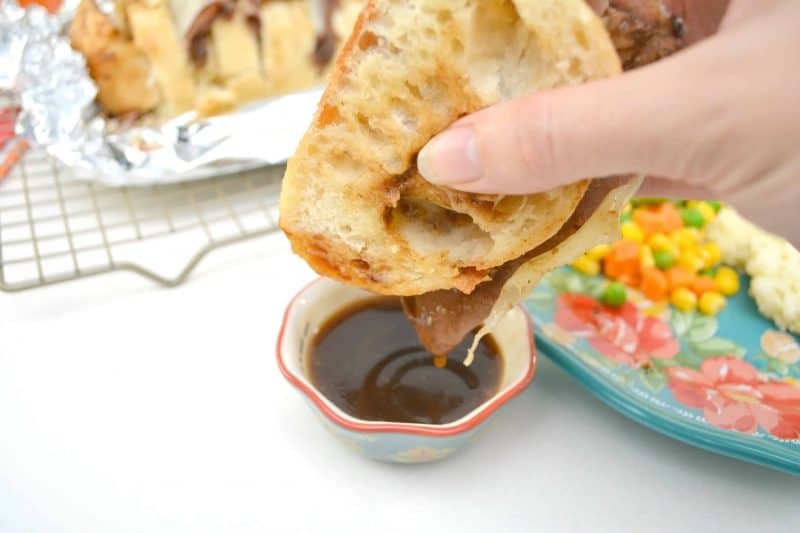 Serve your herb french dip sandwiches with bit of the Au Jus gravy for dipping and enjoy this hearty and flavorful supper! In a small bowl, place butter, 1 tablespoon of Au Jus mix, garlic and herb mix, Worcestershire, and onion powder. Stir until well combined. Line a baking sheet with aluminum foil. Set a loaf of bread in the center and cut into 3/4 inch slices all the way down the length of the loaf, but don't cut all the way through to the bottom, just close. Using a small spatula or butter knife, divide about 1/4 of your butter mixture evenly between each cut of the bread. Once both loaves are securely wrapped, place them in the oven on a baking sheet for about 10-15 minutes or until the cheese to be melted thoroughly and for the crust to get crispy. While the sandwiches are in the oven, combine the rest of the Au Jus mix with 2 cups of water or beef stock in a small saucepan and stir. Bring to a boil, stirring often, and then bring it down to a simmer to thicken a bit until the bread is done. 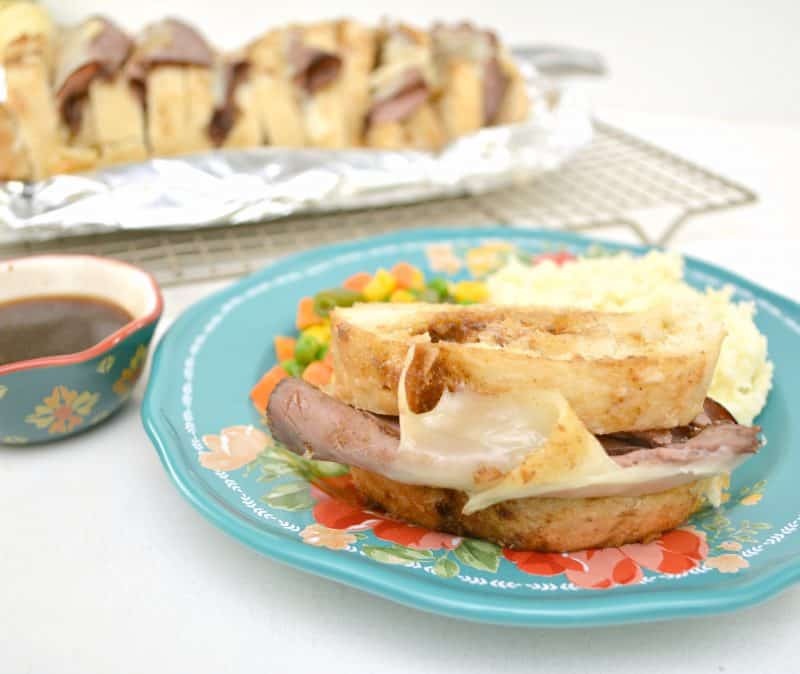 Serve your herb french dip sandwiches with bit of the Au Jus gravy for dipping and enjoy this hearty and flavorful supper! Thank you Robin, I hope you get to try them soon!! 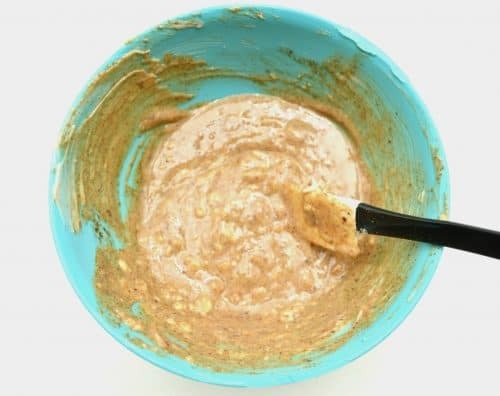 Oh my goodness, I love this Au Jus gravy mix too! 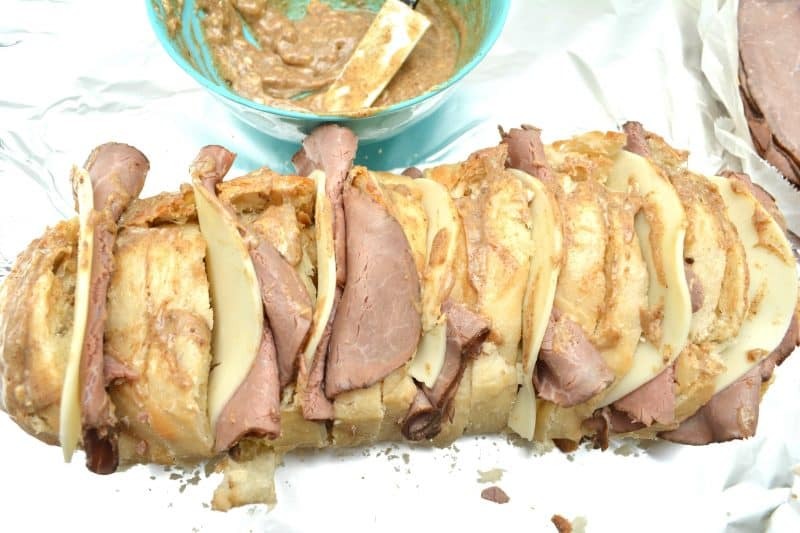 It is great for so many things, now I’m going to try it with this awesome looking French dip sandwich recipe of yours! 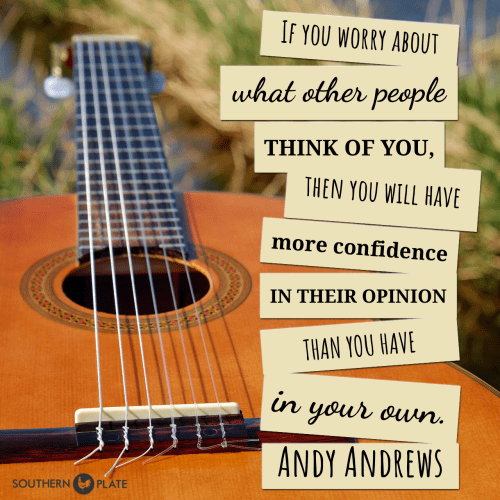 I cant wait to hear what you think!! I love french dip sandwiches and yours looks even better than our local fast food restaurant. I like the idea of crisping them in oven. Oh, my!! I’m so glad I saw this & it sounds so easy & delicious! Thank you for sharing a wonderful shortcut supper we all deserve. I hope you get the chance to try them soon Jan!! Yummy been years since I have had a beef dipped sandwich, this will fit the bill perfectly! Thank you so much for your recipes and your God thoughts, I love all. Thank you so much Karen!! I hope you get a chance to make them soon. May you and you family be blessed as well!! Pinned it! I love French Dips and these look tasty easy. It is just the two of us so one loaf would be more than enough. What would you think about separating the leftover sandwiches and grilling them for another meal? I think that is a great idea Linda!! Wow! These look glorious! I love French dip sandwiches. I love the idea of how you do the herb butter and the assembly so it gets all baked in the oven. How lovely. I do love cooking when I have the time, but some days after working all day and having other things to do, you just don’t have the time or feel like it and having something like this to go to is great. This looks like comfort food to me! Can’t wait to make it. I hope you get the chance to make them soon Jayson!! Barbara, you are one smart cookie!! These were delicious. Posted the photos to my facebook. ty Christy for the kind words and recipes. These will be on my list ‘to make ASAP’ !!! Thanks for sharing a great recipe Christy. I hope you enjoy them Phyl!! Thank you so much for all you do. Love your family. Made this last night and it was a BIG hit. My husband always says, “This one’s a keeper” when he wants you to fix it again. My teenagers liked it too. Win/win! 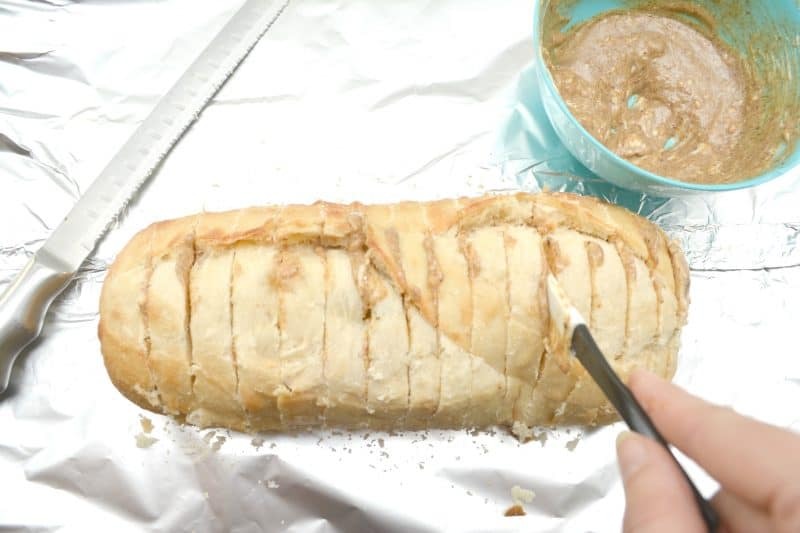 Oh wow… My family loves French Dip, I KNOW this will be a huge hit! This would be perfect to add to my Sunday dinners files: fast on the table, low on mess. : ) Can’t wait to make it! Oh goodness, these were so good. I followed the recipe, but instead of slicing through, etc. I ended up slicing individual slices of bread. I “buttered” the insides with the yummy mixture, then layered the meat and cheese, and lightly buttered the outsides with the rest of the mixture. 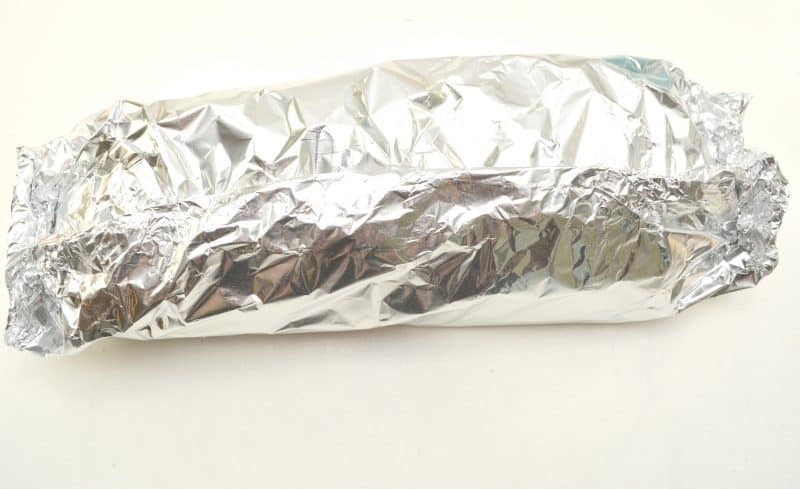 Wrapped sandwiches in foil and baked as directed. I knew my family could not eat a whole loaf of this, so I made three nice sized sandwiches instead, using half the recipe and half of one loaf. So good, thank you very much. I am so glad you liked them Teresa!! Thank you for trying them!! 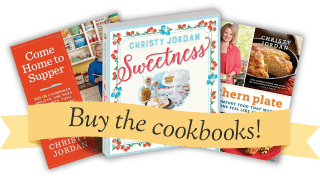 Dear Christy, I love to read and try your recipes! You are the greatest. Whenever I need inspiration to cook I turn to your site. I am looking forward to fixing this sandwich. I also love your scriptures for the month. What a blessing you are! Thank you so much Mimi!! You just made my day!! Make these at least once each month. Really an awesome sandwich. I am so glad you like them Larry!! We like them here too! !